Asbestos, Australia's worst industrial menace, remains a potent threat to its citizens, a decade after its use was banned. It is believed that up to two million tonnes of asbestos were used over a fifty year period. Australian society embraced asbestos technology with an almost unrivalled gusto; as domestic production of blue and white asbestos was insufficient to satisfy demand, 1.5 million tonnes of fiber were imported.1 Australia is paying a high price for its love affair with asbestos; whereas it had once led the world in per capita asbestos use, it now leads in the incidence of asbestos cancer. Over the next two decades, it has been predicted that up to 40,000 Australians will be diagnosed with an asbestos-related disease. On March 20, 2013, The West Australian newspaper published a front page feature revealing that Ernie Bridge, a much-loved public figure from the State of Western Australia (WA), was suffering from a terminal asbestos illness: malignant mesothelioma.2 In his capacity as an Australian Minister (1986-1993), Bridge had overseen the withdrawal of government services from Wittenoom, WA's notorious asbestos mining town. It is believed that as a result of asbestos exposures which took place during trips to Wittenoom, the former politician contracted mesothelioma, as well as asbestosis and other asbestos-related conditions. No one in WA could be in any doubt what this news meant: Ernie Bridge, the first indigenous Australian MP and Cabinet Minister, would, like so many of his countrymen, die from asbestos.3 What no one could have foreseen was that his death would occur on Easter Sunday, less than a fortnight after the news of his diagnosis had been released. The formation of the Asbestos Safety and Eradication Agency (the Agency) announced on March 20 by Minister Shorten was the product of a three-year consultation exercise commissioned by the Labor Government. A sum exceeding twelve million dollars has been allocated to set up the Agency which is expected to commence operations on July 1, 2013. Working in conjunction with local, municipal, regional and federal governments and other stakeholders, the independent Agency will be responsible for the coordination and oversight of the National Strategic [Asbestos] Plan, the ultimate aim of which is to minimise exposure to asbestos fibres, in order to eliminate asbestos-related disease in Australia.6 One of the most important objectives of this plan is the removal of all asbestos from Government and commercial buildings by 2030. By embracing this goal, Australia has confirmed its place as one of the global leaders in the fight against asbestos. Contemporaneously with the announcement by Minister Shorten of the ground-breaking Australian initiative, in Committee Room 154 of Parliament House a seminar was taking place under the auspices of the Parliamentary Group on Asbestos Related Diseases (PGARD). Guest speaker Laurie Kazan-Allen, Coordinator of the International Ban Asbestos Secretariat, addressed the subject of: Australia's Response to an Asbestos Pandemic: National, Regional and Global. Senators, Members of Parliament and civil servants in attendance included PGARD co-chairs Senator Lisa Singh and Russell Broadbent MP. From left: Senator Lisa Singh, Laurie Kazan-Allen, MPs Russell Broadbent and Nola Marino. By a serendipitous quirk of fate, later that afternoon the speaker had a meeting with Minister Shorten and Senator Lisa Singh. The Minister, who had referenced European Parliament asbestos legislation adopted on March 14 in his comments to Parliament earlier in the day, was interested to receive feedback about the European process from Kazan-Allen. A range of subjects was covered during the thirty-minute discussion including the lack of an asbestos ban in New Zealand, proposals for a regional asbestos conference in Canberra and strategy for upcoming asbestos meetings in Europe. What are we to make of the fact that the events discussed in this article took place on March 20? Bearing in mind that three years of consultation had preceded the formulation of the Asbestos Safety and Eradication Agency Bill 2013 and that the PGARD seminar had been mooted six months previously, the concurrence of these activities was coincidental. The tragic news released on March 20 about Ernie Bridge followed so swiftly by the news of his death recapitulated what so many Australians have learned first-hand: there can be no half measures when dealing with asbestos. One can only hope that the Asbestos Safety and Eradication Agency will fulfil the lofty goals it has been set. 1 Serpo A. 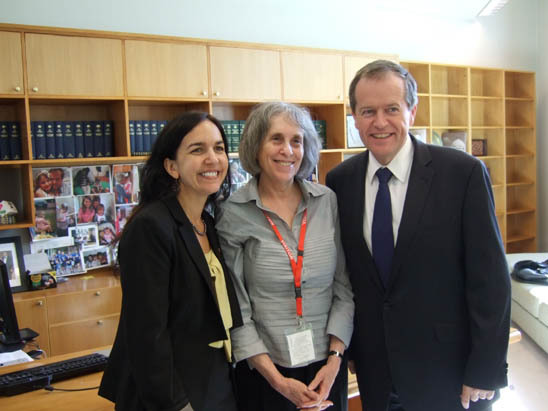 Will Shorten's bill beat asbestos? April 4, 2013. 2 Banks A, Prior N, Trigger R. Ernie Bridges sues over asbestos. The West Australian. March 20, 2013. 3 Banks A, Thomas B. A family man with big ideas. The West Australian. April 2, 2013. 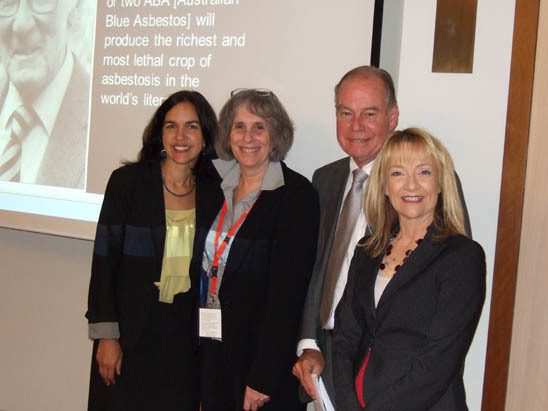 4 National action to tackle Australia's deadly asbestos legacy. Ministerial Press Release. March 20, 2013. 5 Asbestos Safety and Eradication Agency Bill. Speech by Bill Shorten to Parliament. March 20, 2013. 6 National Strategic Plan for Asbestos Awareness and Management discussion draft.